Spring Work Wear 10 x 10 and a Nordstrom Giveaway! Good morning! I have been working on this post for weeks and am so excited to bring you my first ever 10 x 10! – ie. 10 clothing pieces used to create 10 different wear to work looks. I plan on doing this for each season starting, clearly, with spring work wear. For my first ever wear to work 10 x 10, I picked 10 pieces that are versatile without being ‘too classic’. 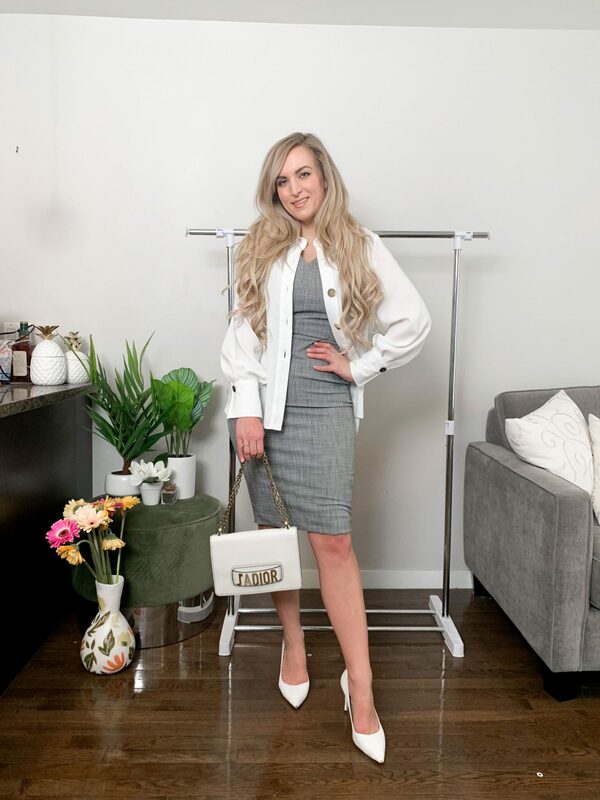 You know that I like to find creative ways to make work wear stylish while still being professional, so that is what I looked for in choosing 10 pieces to create these outfits. 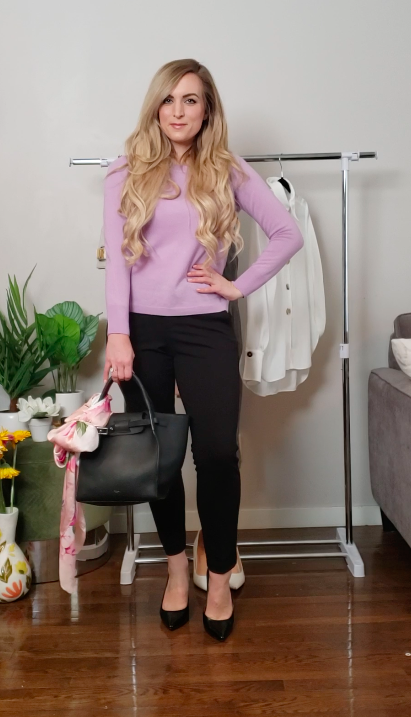 All 10 of my spring work wear looks – 2 full weeks of wear to work outfits – are created with the 10 pieces listed below, with the exception of 2 basics that aren’t included – a white bodysuit (which I’m wearing under outfits 3 & 7) & my black Gucci belt (which I’m wearing with outfits 4 & 7). 1. Liverpool Black Trousers: These slim leg trousers are the holy grail of classic black work pants. They are so soft and comfortable, they are high rise, but not too high rise, and the fit of the leg skims your body without being too tight. Coming in at under $100 US, you can’t beat these pants! 2. Lavender Cashmere Sweater: Perfect for spring, this soft lavender shade in a cozy sweater is a no-brainer. I have this cashmere crewneck in a couple of colors but this is one is the easy choice for spring. 3. Mixed Button Shirt: Instead of a classic white button down, I went with this statement piece. It’s equally as professional and work-appropriate but with more a fashion-forward look. 4. Coral Blazer: Another popular shade for spring is light coral. This soft coral blazer is from H&M, and I just got it in store, but for some reason it’s not online yet – so check your local store. It is online in other colors (Shop it here) and I have also found another light coral blazer (shop it here) in case you are interested. 5. Grey V-Neck Sheath Dress: This under $150 sheath dress is a great staple. I have it from last season in black as well and love it. It fits true to size, but if you are larger in the chest like I am, you may want to size up. There is also a very similar Banana Republic sheath dress that you may want to check out! 6. Black Pumps: Another must-have in my books, you’ve seen these black pumps on my blog 1400 times lol. They are comfortable and under $100. 8. Printed Scarf: A must-have for spring, and an easy way to change up your wear-to-work looks is a floral printed scarf. I love the colors in this one – soft blushes & bright pinks. 9. Celine Handbag: When choosing 10 pieces for a capsule style wardrobe, you definitely want two quality bags. I went with this gorgeous Celine big bag which is from Mine & Yours designer consignment – my favorite designer consignment store. They still have this bag available in store if you are interested!! 10. J’Adior Handbag: I wanted a white bag for spring, and when I found this iconic J’Adior flap bag at Mine & Yours I knew it would be perfect. They don’t have any more of this bag in store, but I found two other designer consignment locations that have it – here & here. Okay full disclosure: I realized after shooting the spring work wear video that I forgot to actually get a photo of this one look 臘‍♀️. This is a screenshot I took from the video, so my apologies for it’s size/quality! Anyway, on to the outfit! Starting with an easy wear to work look- black pants & heels with a lavender crewneck & black bag. To make the look feel more spring- ready I tied the silk floral scarf around the handbag. In my first look with my grey sheath dress, I styled it with the cashmere sweater on top. It’s such an easy way to create more diversity in your work looks without adding more pieces to your closet. Next up, my must-have black trousers with a my light coral blazer. I love the longer length on this and the more boyfriend style fit. I added in the white J’Adior bag for an added pop of spring. 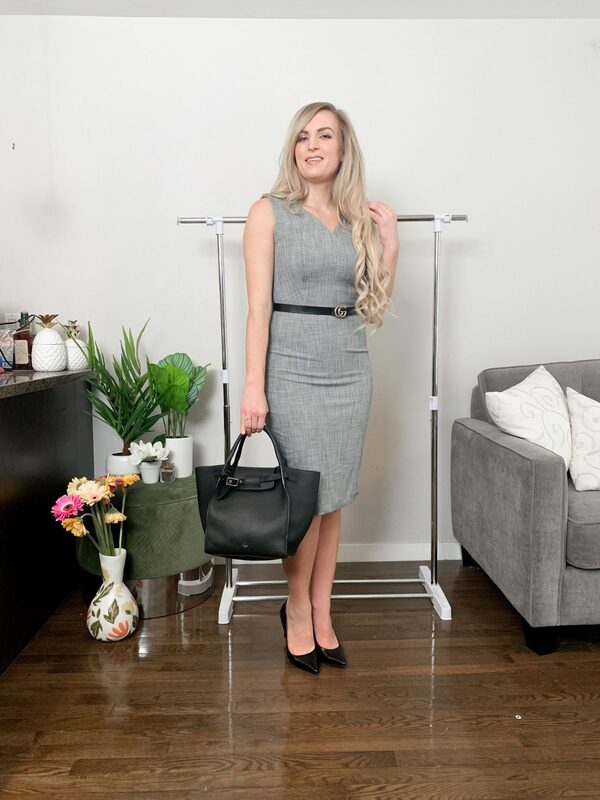 The classic grey sheath dress on it’s own is such a chic work look. I added my Gucci belt to this as I find dresses pop better when you add a belt. To finish up this look I simply went with my black bumps and black Celine bag. Sometimes simple is best! For a lighter look, style the floral silk scarf with the grey sheath dress. To pull out the whites in the scarf to keep the look light and spring-y, go for light accessories. I went with the off-white J’Adior handbag and my white heels. You can’t go wrong with a button-down worn under a sheath dress. The ballon sleeves on this button-down add the perfect bit of extra drama for a bold spring work day look. You can tie the scarf at your neck like in ‘outfit 5’; but tie it underneath the collar of the blouse to create a different look. This blouse, while cool under a sheath dress, definitely deserves to be the focus of an outfit. The mixed media buttons (every button is different) are so freaking cool! To allow this piece to take front-stage, I kept the rest of the look simple with the black pants, black pumps and black Celine handbag. I added my Gucci belt just to add one more pop. In the winter I love blush & grey as a color combination, and come spring I make that combo light coral & grey. It just works so well for the warmer weather. As such, I had to style the light coral blazer with the grey sheath dress. To stay in the world of light colors I went with the white heels to finish up this outfit. The coral blazer can also be worn with your darker more classic pieces – making it perfect for a 10 x 10. 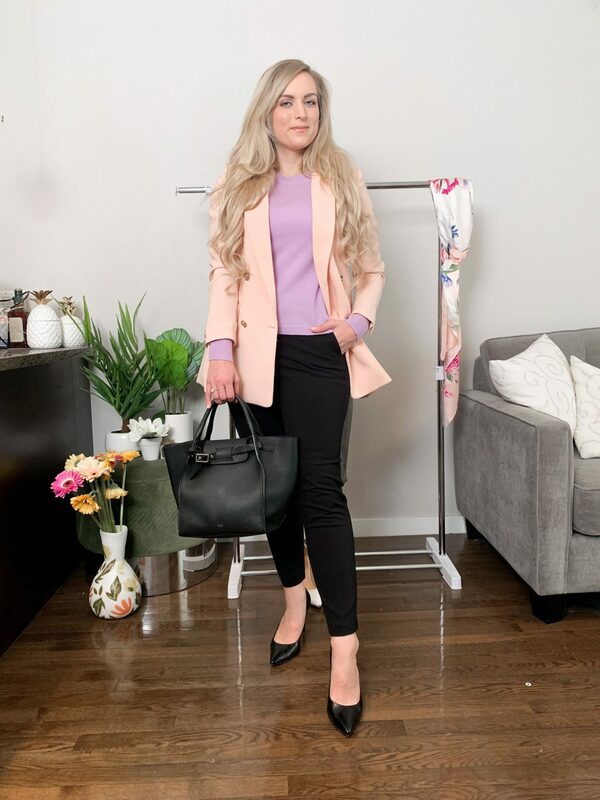 I’ve always liked sweaters and blazers worn together so while the weather is still a bit chilly this spring the lavender sweater pairs perfectly with the light coral blazer. The final outfit!!! To make your 10 pieces create 10 looks, you do have to get creative and one easy way to do that is to swap a blazer for a button down. This white button down is light enough to move easily and looks great styled over a dress. There you have it! I hope you enjoyed my first 10 x 10. Let me know your thoughts in the comments below, and any suggestions you may have! LOVE IT! That lavender sweater is my favorite though. Perfect for Spring. Thank you!! And I totally agree- so great for spring. it’s really lightweight which is great! This is such a fun post! I love wearing things over dresses or under dresses to create variety. I love the lavender color on you too! You are the queen of that layering Laura! I know you did a couple of of winter looks like that on your blog this year and I loved them! I am loving this idea for a blog post and loving how you styled each of the pieces! I am so dying over that handbag. Thank you so much Rebecca! It was SO much time/work (like, triple the work on a usual blog post) so I am really happy people are liking it! These are all so cute and springy! I love how you infused fun colors but still made it professional! How cool is this! Outfits 3, 6 and 10 are my favorites. Love all the ways you can mix up these few pieces! Great capsule wardrobe! Thank you so much this was so much fun to create! I am loving all of these work wear outfits! The colors are so perfect for Spring and I am loving that pink blazer! Girl you absolutely nailed this! So many great combinations and fresh looks for the spring season. Love it!! You put together some killer looks my friend!! 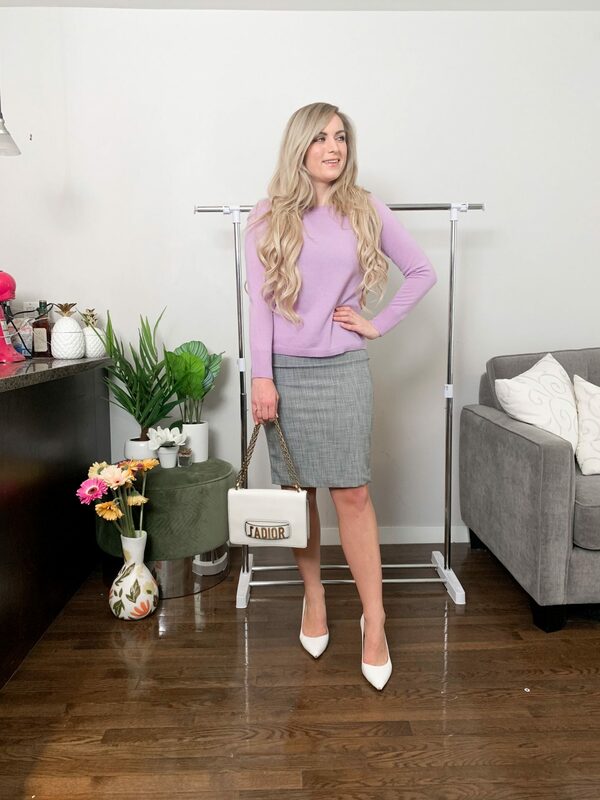 I would have been to timid to pair that blazer with the lilac sweater but LOVE how it turned out! It’s the perfect spring workwear look! Girl you are killing it!! Obsessed with all of these looks!